For those like myself who are interested in the history of rail travel, it is important to consider the development of trains and rail travel in the UK, as this is where the steam locomotive was first developed and used as a method of freight and public transportation. Up until the late 18th century, wagonways existed in a variety of countries, however the wagons which ran on these wagonway tracks were originally animal or human powered. However, as stationary engine and motor technology began to improve, the possibility of creating a steam-power wagon became a reality. 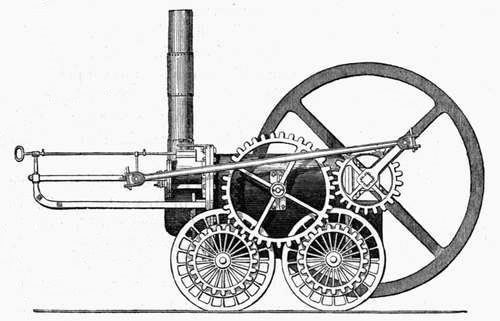 The first working model of a self-propelled steam carriage was produced by Matthew Boulton, James Watt and William Murdoch in 1784, although this could not be used for proper train travel. Richard Trevithick subsequently began designing and testing a variety of high pressure steam engines, and testing these engines in both commercial and public transportation settings. 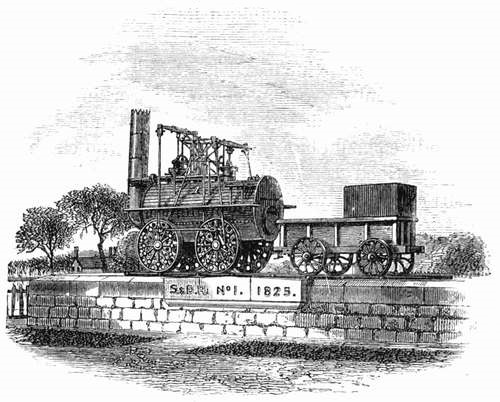 In 1804, Trevithick created a locomotive which was able to pull 25 tonnes of material and around 70 people along a 10 mile track. However, Trevithick’s designs were not taken seriously, and many saw them as novelty inventions. 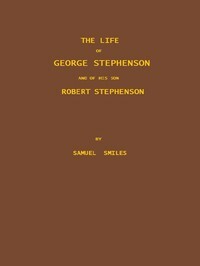 The inventor eventually died penniless and his pioneering ideas are often overlooked in favour of the ideas of George Stephenson. Major early developments of the train took place in the North East of England, where the conditions were ripe for change. A strong industrial setting, a desire for better public transportation and playing host to a number of pioneering engineers helped to spark technological developments. The first public transportation line was eventually opened in 1825, as the Stockton and Darlington Railway, with carriages being hauled by George Stephenson’s Locomotion No 1. Following on from the success of the Stockton and Darlington Railway, railway growth in the UK was rapid, with tens of independent railway companies springing up and laying tracks between settlements. An initial lack of regulation meant that the “network” was somewhat disordered and trains/tracks did not have to meet minimum safety standards. However, a 1840’s Parliamentary Act began to regulate standards, investigate train accidents and make operational recommendations. Independent growth continued until the beginning of the First World War, when the entire network was brought under the control of the state as part of the war effort. Following the First World War, the majority of the railway network was controlled by the Big Four: Southern Railway; London and North Eastern; London, Midland and Scottish Railway; and Great Western Railway. However, due to the increased availability of motor vehicles to the public, the railway network began to go into a slow period of decline. In part due to this decline, taxes on road travel were increased to help to subsidies railways. Following the onset of the Second World War, the Big Four pooled resources and managerial efforts once again, in support of the war effort. From 1948 – 1994, the railway network in the UK was formally nationalised and controlled by the British Transport Commission. Initially, the move was popular, and in the early post-war years, the network became profitable, however the network was making a loss again by 1955. British Railways chairman Richard Beeching was tasked with restoring the profitability of the network, and he began swinging the metaphorical “Beeching Axe”, by closing many smaller stations and branch lines. Whilst this did help to save money, the move was incredibly unpopular in rural communities, many of which relied on the rail networks. The fate of trains in the UK continued to experience peaks and troughs until the 80’s, when cuts to government subsidies saw a serious decline in profitability, passenger experience and punctuality. The privatisation process began again in 1994, and the entire rail network is now controlled by private companies, with occasional government assistance. More travellers now travel by train than at any other point since the 1920’s, and UK railways are considered to be the second safest in Europe. However, the network is still plagued by delays and strike actions. Although the UK rail network is generally pretty safe, some passengers may like to take a look here which might help them to improve their overall safety and also that of their fellow passengers while travelling by train..
How Do You Become a Train Driver? What are the World’s Fastest Trains? The book pictured above is a good read for anybody interested and it is free in ebook format from Project Gutenberg.